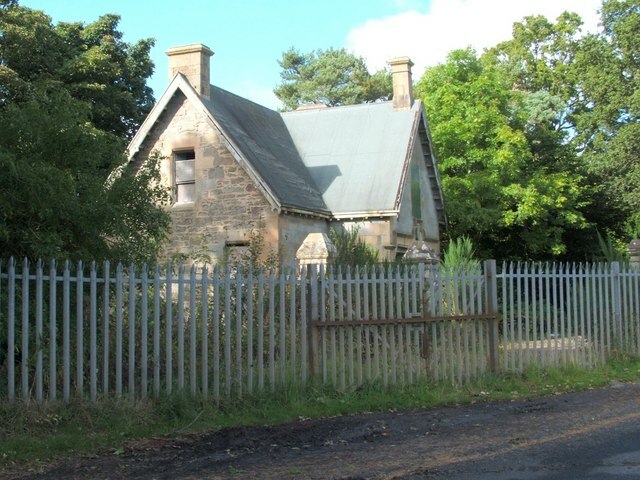 This building was the South Lodge, one of two lodges that were associated with Kilmahew Estate. The estate was centred on Kilmahew House (for more on the history of the estate, see the latter part of NS3578 : St Peter's Seminary, Cardross). For details of the building, see NS3577 : Remains of the South Lodge and NS3577 : South Lodge (detail). Signs on the barrier, and on the front of the building itself, read "Dangerous Building - Keep Out". By the end of 2008, the former lodge had been demolished: NS3577 : Site of the former South Lodge. Kilmahew Estate also had a West Lodge, which, at the time of writing, is visible as a ruin: see the link in the end-note.